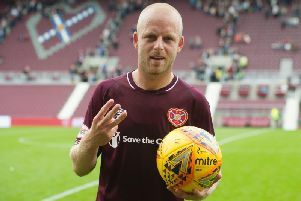 Australian midfielder Ryan Edwards scored twice as Hearts beat Aberdeen 3-1 to secure their place in the Reserve Cup final. Edwards, 25, who spent the first half of the season on loan at St Mirren and is yet to make a first-team appearance for the Jambos since signing a two-year contract in June, struck in each half at Oriam. Hearts went ahead in the 15th minute when Connor Smith slotted the ball underneath Dons goalkeeper David Craddock. The lead lasted just five minutes as home goalkeeper Kevin Silva came out to punch the ball clear but collided with Aberdeen striker David Dangana, who picked himself up to send the Hearts No.1 the wrong way from the penalty spot. With half-time approaching, Edwards capitalised on a mistake in the Aberdeen defence to slot home. In the second period, Andy Irving and Lewis Moore were both denied by fine saves from Craddock. Edwards made it 3-1 after Craig Wighton knocked the ball into the box and the former Partick Thistle man got enough on it to beat Craddock. Aberdeen were reduced to ten men in injury time, Ethan Ross given his marching orders for a late challenge on Hearts skipper Chris Hamilton. Hearts will meet Motherwell in the final on April 1 – the venue yet to be confirmed – after the Fir Park side overcame St Johnstone 2-0 in the other last-four tie. Aberdeen: Craddock, Harrington, Mackenzie, Campbell, Power, Roscoe, Brown, Virtanen, Dangana, E Ross, Antoniazzi. Subs: Mair, Robertson, Turner, Duncan, Barron, Shanks, Barry.